How do I choose the correct sigma when applying a Gaussian filter to a fixation density map? I am currently analysing some eye tracking data which I recorded in the lab. For my fixation density maps I calculate tables showing the number of times participants made a fixation at a specific coordinate on the screen. I then filter them with a gaussian filter (with the matlab function imgaussfilter), however I am not sure how to choose sigma sensibly. I would like to adapt to a paper I based my experiment on. In the paper they used a '2D circular Gaussian Kernel with 0.5° full width at half maximum'. I am not fully sure what this means. Does degree mean visual degree? How can I transfer this to my analysis? Yes, they almost certainly mean visual degrees. I presume you know how to calculate visual angles at the distance of your display and how to transform your eye tracked data to that coordinate system. Full width at half maximum (FWHM) means just what the individual words say: for a Gaussian filter, there are going to be two points on either side of the center that are half of the maximum height of the Gaussian. When you mention authors writing 2D circular Gaussian Kernel with 0.5° full width at half maximum they mean that the width of their kernel defined this way is 0.5 degrees (or more specifically, the diameter is 0.5 degrees, because they are talking about a 2D circular kernel). 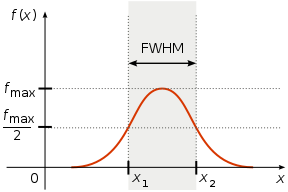 Kernel widths can also be described as "half-width at half-maximum" which would be half of the FWHM. To know what sigma to use, you will need to know how the units of your tracking measurements relate to visual degrees. Not the answer you're looking for? Browse other questions tagged cognitive-psychology data analysis matlab or ask your own question. Why is it easier to remember the correct response for problems with many options rather than just two? What happens when a person “imagines” how food could taste like just from looking at it? How to measure change in emotional responses when pre and post tests use different measures? What is the psychological term for disregarding correct but unwanted information? What's the psychological basis for “Look at me when I'm talking to you”? Why do children tend to choose the last option in a two-alternative forced choice task? When to use standard versus moderator regression techniques for the most parsimonious approach?